They are utilizing “CRISPR” technology to create pigs with human DNA. Science is now a step closer to genetically modifying pigs to be more human-like. This brings hope to desperate people wishing to prolong their lives or the lives of their loved ones. Major investors are banking on xenotransplantation. They have a personal interest in speeding up research in order to save their own loved ones. Biotechnology executive, Martine Rothblatt’s daughter suffers from a potentially fatal lung disease. This encouraged her to inject around $50 million into pig-human organ transplant research. This enormous financial incentive has enabled the research to speed ahead. Scientists kept a baboon alive, using a pig’s genetically modified heart, for 945 days. Similar experiments involved a kidney swap between the two species. 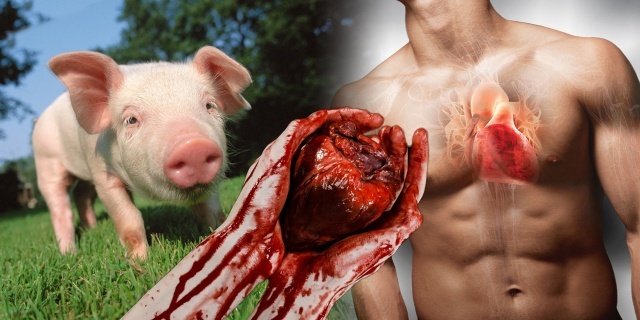 How will scientists make human pig chimeras for organ harvesting? CRISPR is the biotechnology that scientists are employing to create human-pig chimeras. CRISPR has been the biggest breakthrough that changed the science of genetic engineering. Previous methods for engineering the DNA in genes were less reliable. CRISPR utilizes RNA, rather than proteins, to change or mutate DNA sequences. Pig embryos will have their DNA altered to contain human DNA sequences. Scientists claim this will produce organs compatible with a human transplant, within the pig. However, researchers stress that it is still a long way away. The company was co-founded by George Church, a Harvard Medical School geneticist, and Chief Scientific Officer Luhan Yang. They are working to eliminate all the perceived obstacles currently preventing xenotransplantation. At the turn of the 20th century, mad scientists beginning experimenting with xenotransplantation. But they would only end up killing their human patients. The human immune system violently rejects animal organs. By creating pigs with human DNA, the scientists hope to “humanize” the pig’s immune system. They hope to avoid humans rejecting pig organs. Cloned pigs will breed in sterile environments in order to try to avoid catching viruses. Viruses that are harmless to pigs can be deadly to humans. Understandably, the ethical and moral dilemmas of creating pig-human chimeras are numerous. Most countries of the world have inflamed discourses over abortion. When does life begin? What is human life? What defines a human? Would killing pig-human chimeras be the same as murder? Animal rights activists and religious fundamentalists already are creating an outcry. “Campaign for Responsible Transplantation” (CRT) is a non-profit organization that opposes xenotransplantation. They have already filed a lawsuit against these scientists. They believe the scientists are being irresponsible and are arrogantly playing god. CRT believe there are many alternatives to xenotransplantation. They believe it is lazy and cruel to punish animals. Why should humans sacrifice these innocent creatures to pay for self-destructive human behaviors? Most people create organ damage in their bodies through bad eating habits. Ironically, pork and bacon can lead to the heart disease that requires a heart transplant! Currently, we use human to human organ transplants. This requires a fore-thought of kindness from a donor. This donor offers their organs for transplantation upon their death. Such organs don’t even have the best success rates. Half of all human to human transplant recipient’s bodies reject the organ. This occurs within 5 years of the surgery taking place. This should take priority over meddling with chimeras. CRT also suggest that organ delivery systems need improvement. Larger campaigns to promote organ donation should occur to increase the quantity available. Exploring cadaveric organ donation would also provide more organs to desperately sick people. The donor criteria should become less strict. Older donors could donate if scientists shifted their research onto making this feasible. Research should look at creating greater immune tolerance between human to human donations. Financial incentives could also encourage more people to donate. The tens of millions of dollars researching xenotransplantation could be better spent. Ethical alternatives are much less expensive to research. Allegedly, in the US alone, 22 people die each day because they could not get a donor organ. Those requesting to be recipients number around 120,000 people. This is a lot of people who are suffering, and a lot of grief for loved ones. Prevention still stands as the superior cure. At least until we find feasible organ transplant solutions. People simply improving their decadent lifestyles would increase the quantity of available organs. Those born with diseases requiring transplants would more likely receive an organ donation. People who get organ transplants after a life of smoking and unhealthy eating, are selfish. They are essentially stealing life from those who legitimately require organ transplants.